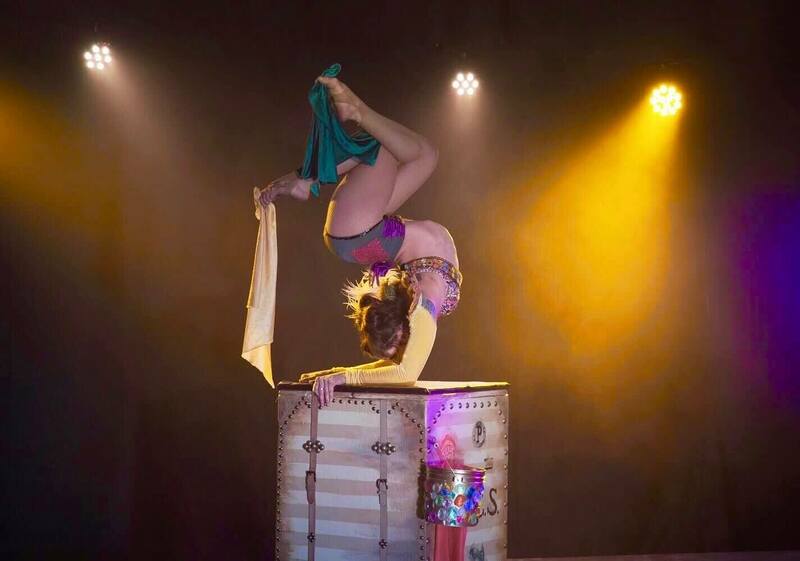 Tina Phoenix performs world class Contortion acts involving mischievous characters, as well as sultry character work in the category of Cirque. Bending her body with smooth, grace and control that requires strength and balance that creates memorable images for the viewers. Choreographed to music or set to ambience. Makeup and costuming will leave you watching a character from another world. Intimate audiences or on large stages, these acts set a tone and mood for any gathering, party, event or show. Contorting her body whilst bending the minds of her crowd. Available for Stage Acts, Roving Characters, Ambient performances, etc. – (4X4 PLUS ) Riser or Lifted Box, Table or Stage for best performance! CirqueSanity can include the rental of a table if needed upon request. – Contortion CAN be done pretty much anywhere HOWEVER, something elevated is always better as Tina’s body gets mighty small whilst contorting. An elevated stage or platform will assist in a full crowds ability to see her perform in awe and without visual restriction of the show. – Open Dance floors and Stages also fun. CirqueSanity Presents! : Trunk Contortion in "Voila!"